For additional protein, try adding chopped cooked chicken, beef or tofu to the vegetable mixture. Our favorite vegetables to add to this recipe are green beans, frozen broccoli, fresh chopped squash and carrots. Check out What's in Season in CT and add whatever you like! Cook egg noodles according to package directions. Drain well. Heat a large nonstick skillet over medium heat. Add oil and cook garlic, fresh ginger if using, scallions if using, salt, and chili powder until golden, about 1 minute. Add vegetables and water. Cook until vegetables heat through, about 3 minutes. Add barbecue sauce, soy sauce, and peanut butter; stir until sauce is smooth. 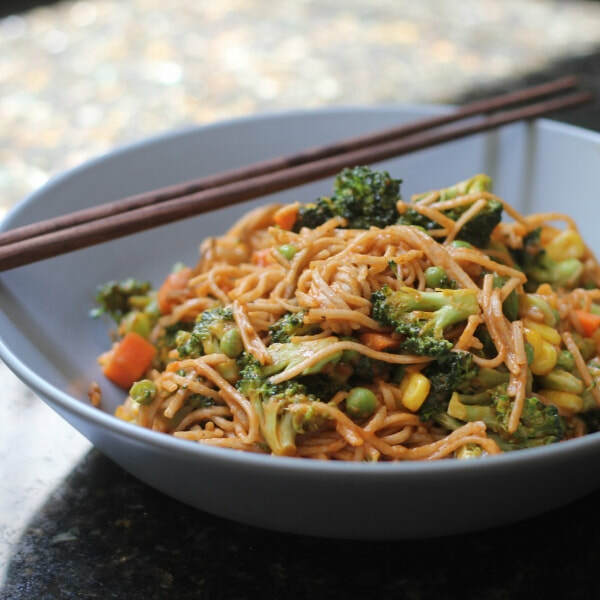 Toss sauce and vegetables with egg noodles and chopped peanuts. Notes: Try adding chopped cooked chicken, turkey, or beef to the vegetable mixture. Use green beans, frozen broccoli, fresh chopped squash or carrots.